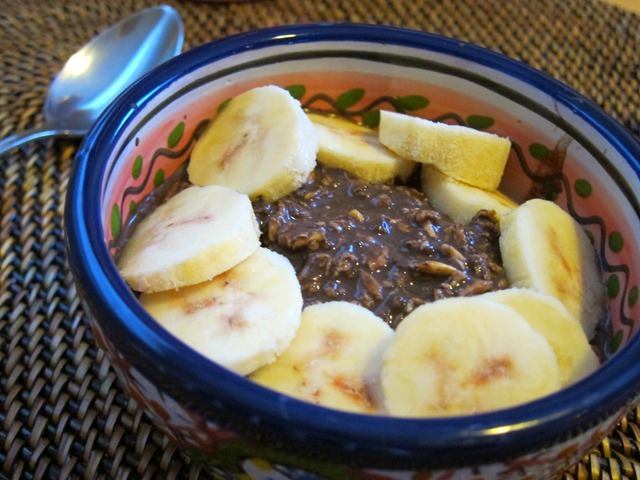 Thankfully I decided to give overnight oats another go and used almond milk with the Greek yogurt. This combination suits me much better. Now I love ‘em! 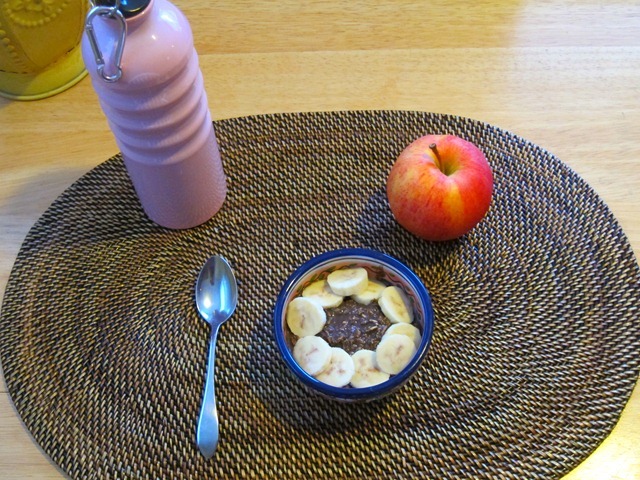 Since I finally figured out that using milk with yogurt is the key to my personal love of overnight oats, I had to make them again for breakfast this morning. 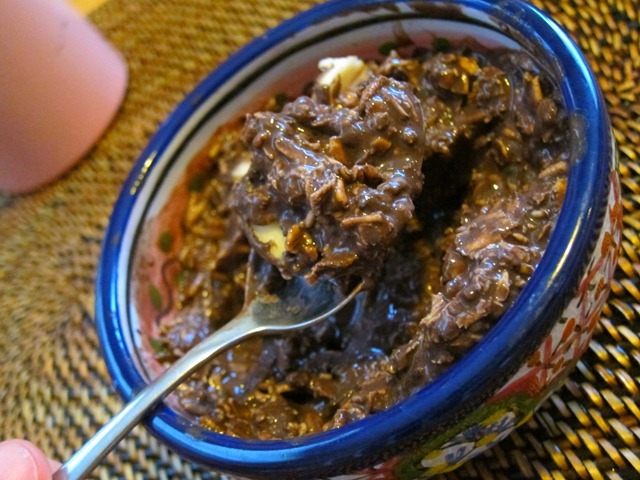 I’ll call today’s batch uber chocolaty overnight oats. 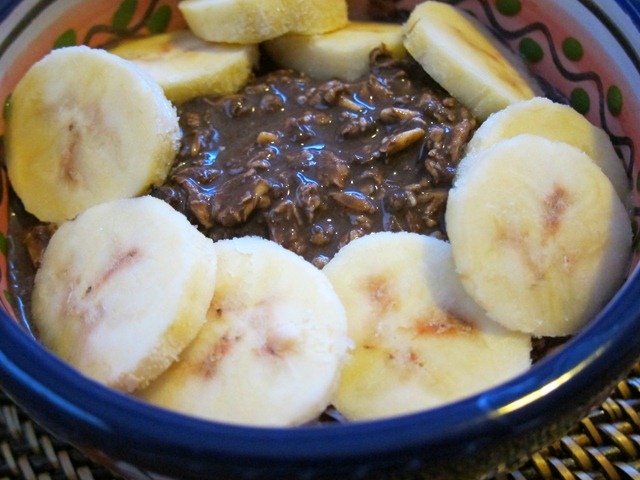 Then, this morning I added frozen banana slices to the mix. After stirring everything up, it was time to dig in. If you’re a big fan of really chocolaty foods, try this baby out. I’m all for sneakin’ a little chocolate into my day first thing in the morning. Before breakfast, I headed to the gym with Ryan to complete 20 minutes of cardio on the elliptical before taking a BodyPump class. After BodyPump, I met up with my friend Merri to take Sadie on a 20-minute walk. Merri is officially moving to New York at the end of May and I am getting really sad about her departure. I told her yesterday that Ryan and I have to find a time this summer to visit Merri and her boyfriend. I really want to see the big city (I’ve only been once before and I was too young to remember) and I like to have a date to look forward to in the future when I know I’ll see her again. For me, having a date set when you know you’ll see someone in the future makes it easier to say goodbye because it doesn’t feel so permanent. I remember when I was in a long distance relationship before I met Ryan, I always wanted to have the next trip on the books before the current visit was over, otherwise I’d be an emotional basket case at the airport. i’ve been in a long distance relationship for 6 years! my boyfriend and i started dating since we were fifteen & we’re still going strong. it’s actually better than ever! I’m wondering what type of chocolate cocoa powder you use. I’m sure some are better than others- any recommendations? i love hershey’s special dark! Hello! i found it interesting to make 😀 without feeling any boredom about oatmeal!! 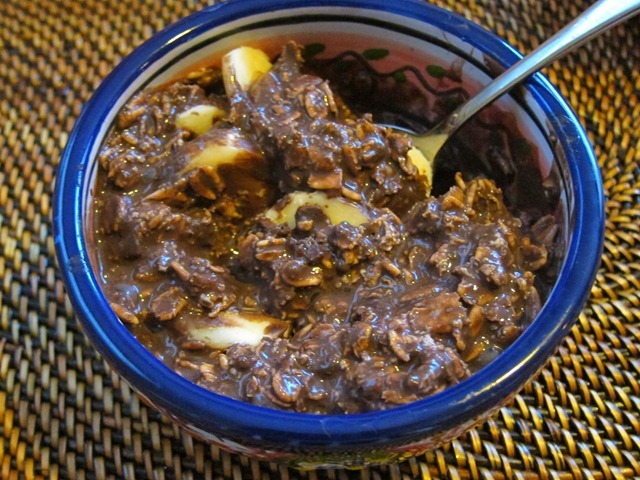 i have tried myself to make your oatmeal recipes but never tried this one. Anyway, can flaxseed substitute chiaseed? i barely can find chiaseed in my country due to the unfamiliar meal (i’m Indonesian). 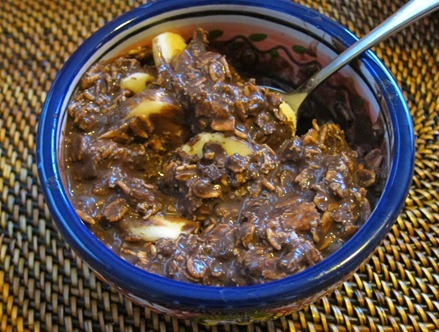 I just made the uber choco overnight oatmeal =] I hope it turns out well!! I recently found your blog and I love it!!! I read it daily. I am working on becoming a registered dietitian so I love your health related posts as well as all the baby updates!! I noticed you love overnight oats and I do too! I eat mine with: oats, coconut milk, cinnamon, tiny splash of vanilla, frozen fruit and peanut butter! I know you love peanut butter so I thought I would share. 🙂 also I love that cinnamon includes other awesome health benefits! !